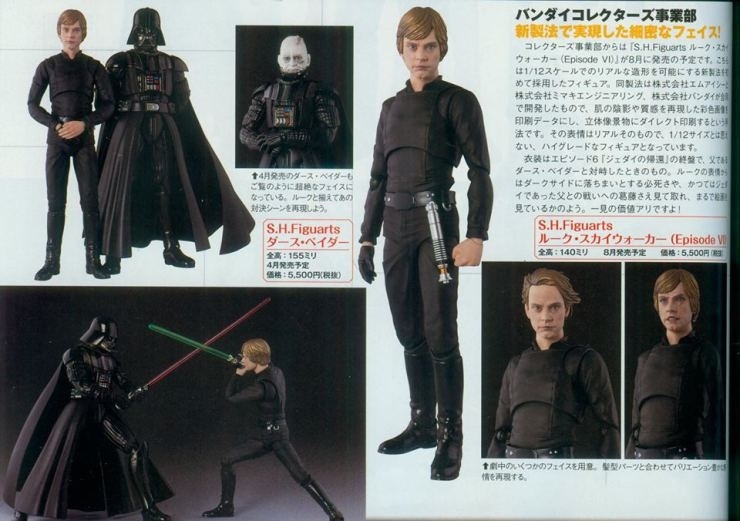 This Luke Skywalker figure from S.H. Figuarts looks pretty awesome. It is based on Luke as he looked in Return of the Jedi. The interesting thing here is that judging by the scans here, it looks like he has interchangable hair and heads. Give Luke that windswept look, which for some reason makes him look like Tobey Maguire. Apparently he also comes with an alternate unmasked Darth Vader head, which is awfully weird if you don’t already have the Darth Vader figure to put it on. Luke is listed as standing 5.5 inches tall. Aside from that weird windswept hair look, this looks like a solid, nicely detailed figure from the line. Luke looks appropriately badass in his Jedi gear and gloved hand.